Some things are timeless. And TAG Heuer’s Link timepiece is one of those things, thanks in part to its enduring design, exquisite details and—on a more practical note—its flawless comfort on the wrist. 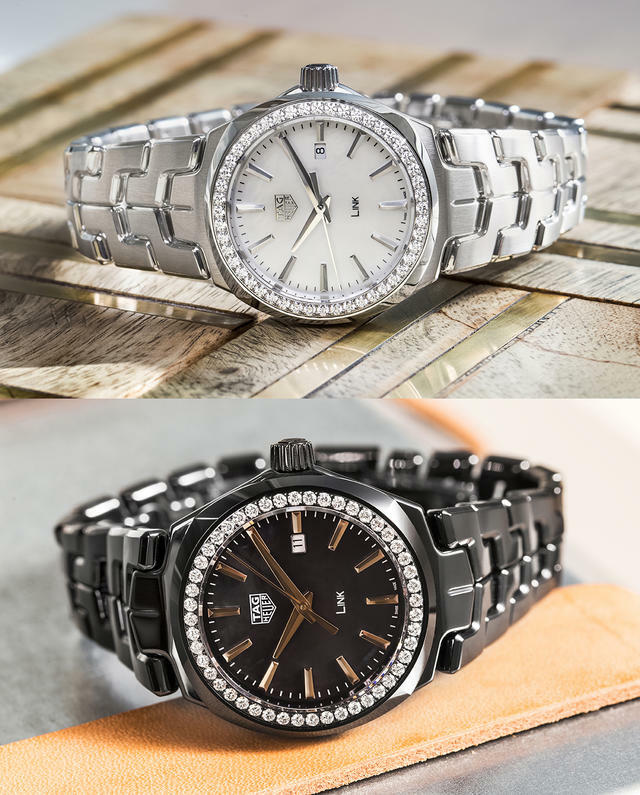 Dating to 1987, the TAG Heuer Link has embraced many iterations over the years, and this fall the collection has reinvented itself with ladies in mind. In steel or black ceramic, with a perfectly elegant 32mm case, the quartz-driven Link Lady now features a bracelet that is fully integrated into the case. In addition, the horns have been removed, resulting in a seamless, pared-down aesthetic that works well on the eye—and on the wrist. The bracelet maintains its curved profile, and the distinctive S-shaped links’ finish offers a highly polished shine on the contour while the upper surface of each is expertly brushed. I’m a big fan of dual finishes on a watch, and I think it adds dimension and interest to the Link Lady’s overall appeal. The bracelet is securely affixed to the wrist by a polished “butterfly” clasp with safety push buttons. The case’s silhouette is best described as a beautiful marriage of round and cushion shapes, with four very subtle but nonetheless visible corners. 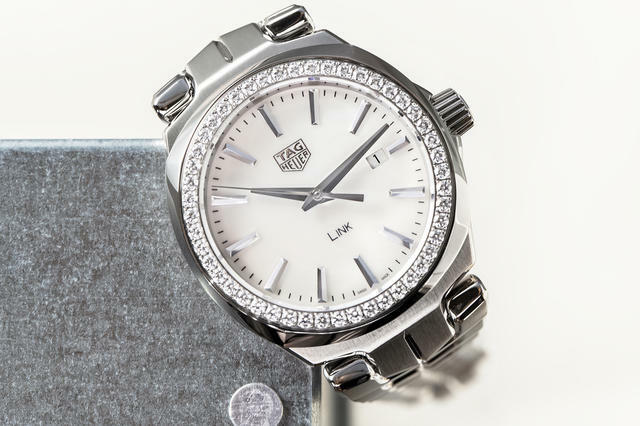 The round fixed bezel, available plain or set with diamonds, hugs the mother-of-pearl dial, which features a date window at 3 o’clock and diamond or polished faceted indexes marking the hours. The dial offers variety in the collection: some feature a thin layer of black or blue-gray lacquer, while others are in classic white. The Link Lady welcomes two ceramic variants—a premier in the Link line. Both in black, the first is polished to a perfect shine, while the other is sandblasted to create a fashionable matte look. Ceramic has been used in watchmaking by many high-end manufactures for a number of years now, and its positive properties are many. Its smoothness is not only attractive and comfortable, but also scratch resistant, and its color maintains its original luster over years of use. Another plus, it is extremely lightweight despite its hardness, making it the perfect choice for watch lovers who rely of their timepieces for many hours in a day. The polished black ceramic version shown here features a black mother-of-pearl dial and a diamond bezel. 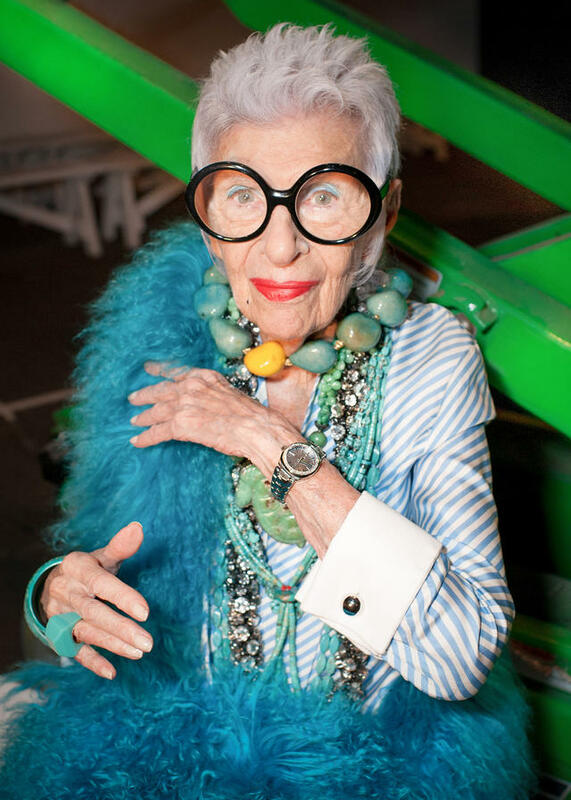 New York’s Fashion Week in September saw the official unveiling of the Link Lady collection, with fashion icon Iris Apfel featured as a friend of the brand and a fan of the new line. The 95-year-old Apfel sat front row surrounded by fashion’s elite, including editors, bloggers, stylists and celebrities wearing both the new Link Lady and designs by MONSE. Also during that week, TAG Heuer participated with megaproducer IMG in a fashion pop-up shop located on Washington Street.